Vitamin D is very important to the body for many reasons. This vitamin can be obtained through dietary sources or made in the body through the exposure of sunlight. Vitamin D is very important to the body for many reasons. This vitamin can be obtained through dietary sources or made in the body through the exposure of sunlight. Hence, vitamin D is also known as the sunshine vitamin. Vitamin D, stored in our fat cells, is a fat-soluble vitamin and is for use when it is needed. Vitamin D keeps the bones healthy and strong. It is regularly being used for enhancing absorption in the intestines of minerals like calcium, iron, magnesium, phosphate, and zinc. Vitamin D is good for individuals with conditions such as high blood pressure or hypertension. Researchers at Boston University evaluated individuals with high blood pressure and had them exposed to UVA and UVB rays for three months. Vitamin D levels in these individuals increased by 100%, and their blood pressure levels normalized. One theory is that vitamin D reduces blood pressure by decreasing the production of a hormone called rennin, which is responsible for high blood pressure. Vitamin D deficiency is a worldwide problem and recognized as a pandemic. The major cause of vitamin D deficiency is a lack of sun exposure. Many Americans mistakenly believe they are not at risk because they consume vitamin-D-fortified foods like milk and milk products. African-Americans are with the greatest likelihood of vitamin D deficiency because the pigment melanin in their dark skin acts as a natural sunscreen. They may need as much as 10 times more sun exposure to produce the same amount of vitamin D as an individual with pale skin. Low vitamin D levels have been strongly associated with dementia and Alzheimer’s disease. Dementia is a decline in thinking abilities, behavior, and memory that impairs normal daily activity. According to the Alzheimer’s Association, Alzheimer’s disease is the most common form of dementia, accounting for as many as 80% of dementia cases. A study, published in Neurology, concluded that vitamin D deficiencies in older adults can double the risk for some varieties of dementia. Another study suggests that individuals who are vitamin D deficient are twice as likely to be diagnosed with schizophrenia. According to the National Alliance on Mental Illness, schizophrenia is a severe mental disorder characterized by abnormal social behavior and failure to recognize what is real. This disorder affects more than two million American adults. Vitamin D deficiency can also increase the risk of poor brain function after cardiac arrest sevenfold. Also, researchers evaluated the relationship between vitamin D levels and coronary artery disease. They found that deficiency of this vitamin was linked to a higher prevalence of coronary artery disease. Lastly, vitamin D deficiencies have also been associated with cancer, particularly prostate cancer. It has been found that individuals with low blood levels of vitamin D have more aggressive variants of prostate cancer. Moreover, it has also been noted that high vitamin D levels may increase breast cancer survival rates. It is important to seek the advice of a healthcare professional before making any alterations to your health routine such as incorporating vitamin d supplements into your daily supplement regimen or adding foods high in vitamin d to your diet. Wortsman, J., Matsuoka, L. Y., Chen, T. C., Lu, Z., & Holick, M. F. (2000). Decreased bioavailability of vitamin D in obesity. The American journal of clinical nutrition, 72(3), 690-693. Littlejohns, T. J., Henley, W. E., Lang, I. A., Annweiler, C., Beauchet, O., Chaves, P. H., ... & Llewellyn, D. J. (2014). Vitamin D and the risk of dementia and Alzheimer disease. Neurology, 83(10), 920-928. Valipour, G., Saneei, P., & Esmaillzadeh, A. (2014). Serum vitamin D levels in relation to schizophrenia: a systematic review and meta-analysis of observational studies. The Journal of Clinical Endocrinology & Metabolism,99(10), 3863-3872. Jayasinghe, Y., Grover, S. R., & Zacharin, M. (2008). Current concepts in bone and reproductive health in adolescents with anorexia nervosa. BJOG: An International Journal of Obstetrics & Gynaecology, 115(3), 304-315. Gottesman, I. I. (1991). Schizophrenia genesis: The origins of madness. WH Freeman/Times Books/Henry Holt & Co.
Murphy, A. B., Nyame, Y., Martin, I. K., Catalona, W. J., Hollowell, C. M., Nadler, R. B., ... & Kittles, R. (2014). Vitamin D Deficiency Predicts Prostate Biopsy Outcomes. Clinical Cancer Research, 20(9), 2289-2299. Mohr, S. B., Gorham, E. D., Kim, J., Hofflich, H., & Garland, C. F. (2014). Meta-analysis of vitamin D sufficiency for improving survival of patients with breast cancer. Anticancer research, 34(3), 1163-1166. Holick, M. F. (2007). Vitamin D deficiency. New England Journal of Medicine,357(3), 266-281. Holick, M. F., Binkley, N. C., Bischoff-Ferrari, H. A., Gordon, C. M., Hanley, D. A., Heaney, R. P., ... & Weaver, C. M. (2011). Evaluation, treatment, and prevention of vitamin D deficiency: an Endocrine Society clinical practice guideline. The Journal of Clinical Endocrinology & Metabolism, 96(7), 1911-1930. Wang, T. J., Pencina, M. J., Booth, S. L., Jacques, P. F., Ingelsson, E., Lanier, K., ... & Vasan, R. S. (2008). Vitamin D deficiency and risk of cardiovascular disease. Circulation, 117(4), 503-511. Wilkinson, R. J., Llewelyn, M., Toossi, Z., Patel, P., Pasvol, G., Lalvani, A., ... & Davidson, R. N. (2000). Influence of vitamin D deficiency and vitamin D receptor polymorphisms on tuberculosis among Gujarati Asians in west London: a case-control study. The Lancet, 355(9204), 618-621. Holick, M. F., & Chen, T. C. (2008). 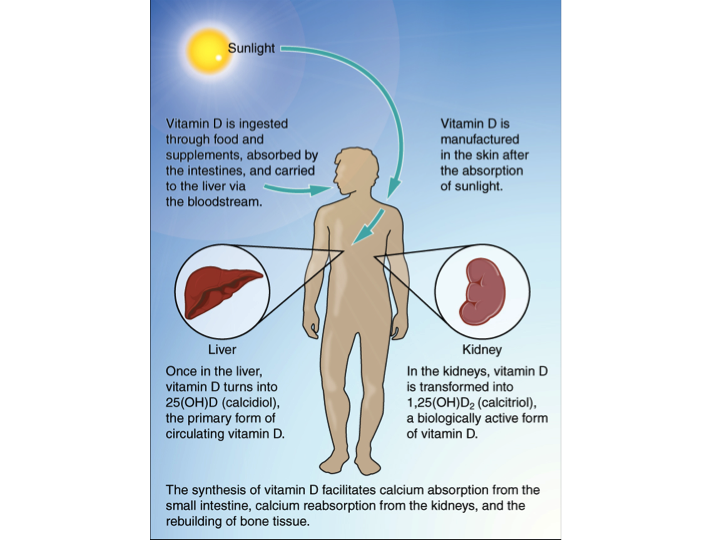 Vitamin D deficiency: a worldwide problem with health consequences. The American journal of clinical nutrition,87(4), 1080S-1086S. Lips, P. (2001). Vitamin D deficiency and secondary hyperparathyroidism in the elderly: consequences for bone loss and fractures and therapeutic implications. Endocrine reviews, 22(4), 477-501. Wagner, C. L., & Greer, F. R. (2008). Prevention of rickets and vitamin D deficiency in infants, children, and adolescents. Pediatrics, 122(5), 1142-1152.